Advanced, high tech laser gear played in the great outdoors. 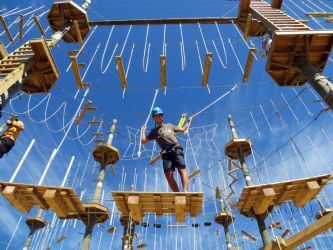 A part of Rise and Climb Adventure Course located at the Terry Fox Sports Complex in Cornwall, PEI. Not all laser tag guns are created equal. You will appreciate this when you play with our military grade laser tag rentals that use infrared and RF signals. You won't find better laser tag gear on Prince Edward Island. Get the info you need. Please book ahead by contacting the office. Find out our current booking times and hours. Planning a party or an event? Rise and Climb Adventure Course.